Chris was schooled locally at Michaelhouse and completed his post matric at Kingswood College. Hereafter, Chris played tennis professionally in Europe on the Satellite circuit, gaining valuable exposure and experience. During this period Chris was based in Copenhagen under the guidance of Ernst Ecks, where he played for the B93 Tennis Club in between Satellites and tournaments in France with a FFT ranking of 0. 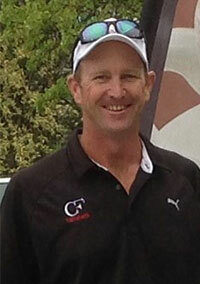 Chris is a qualified Professional Tennis coach with TSA (Tennis South Africa) and has a B.Com Accounting degree (UNISA). Chris founded his tennis academy more than a decade ago, and at one point provided a Sattelite branch for the Spier Tennis Academy in Cape Town. For the last 16 years Chris has been growing CF tennis in the KZN Midlands and employs a loyal, dedicated & qualified coaching team, whom he guides & oversees closely.